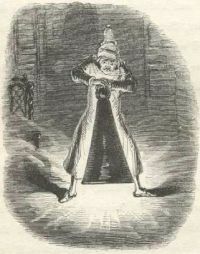 Ebenezer Scrooge in a 19th woodcut by John Leech. The holiday season is my favorite time of the year. Every year I look forward to it with great excitement, eagerly anticipate it, and can’t wait for it to arrive. Most especially, I love Christmas. While I know it may sound corny and cliché to some, I do believe that it is truly magical and profoundly special, a phenomenon of incredible power that can heal and transform our individual lives, relationships, and broader culture. It is the one time during the year when joy, happiness, kindness, peace, etc. are nationally-sanctioned experiences that have become the expected norm for our lifestyles and interactions with others…at least until the end of the season. Holiday slogans such as “peace on earth,” “good will toward men,” “tis the season to be jolly,” and “Merry Christmas” serve to remind us of what the holiday season is supposed to mean and represent. However, how many of us can honestly say that our current experience and observations confirm the existential realities that underlie these holiday expressions? Have they not, to an alarming degree, become mere popularized catch-phrases that we feel obligated to repeat, in which we half-heartedly or perhaps have even ceased to believe? Do they not mock and rise up to accuse us of infidelity and blasphemy? For in truth, all too often our lived experience of the Christmas season is not congruent with them. When we hold up the Christmas mirror, a very different and disconcerting image is reflected back at us. The central problem is that when most of us look within and around ourselves, we don’t encounter peace, good will, jolliness, or genuine merriment. Instead, we are confronted with destructive conflict, malice and hostility, disgruntled frustration, and consumer-driven unhappiness. To a large extent, we don’t feel jolly or merry and we look upon others with anything but “good will;” we rather feel impatient, pressured, hyper-stressed, exhausted, and just want other people to get out of our way. The full-throttle shopping and commercial frenzy propels us forward with an unrelenting guilt and anxiety in the form of “I must:” get all of the very specific things on everyone’s Christmas lists; get the Christmas tree; put up the Christmas decorations; design and mail the end of the year holiday family cards, etc. At any cost it must all get done, and we get it done, don’t we? Tragically, we are indeed too often willing to pay whatever cost is necessary to keep the Christmas machinery rolling, and sadly, the cost is our ability to be present to the wondrous and miraculous nature of Christmas. To varying degrees, I have experienced this terrible cost for a number of years, and unfortunately, this year is proving to be no different. Every year I am haunted by the fear and cruel irony that I will miss my most beloved holiday and I feel once again that I am missing it. This is an inescapable fact regarding my current situation, but there is another obvious and immutable fact within this situation that I must consider…Christmas day is still a week away. Therefore, vital questions are: Does it have to be this way? Can my experience of the Christmas season change? Can I change? And the answers are: No, it doesn’t have to be like this, and yes it can change because there is still time, if I choose to change how I live Christmas. Perhaps what I and we all most need is to be haunted more intensely by a stark and pitiless awareness of the cost of missing Christmas. I think of a notorious and iconic character who in response to such a haunting radically changed his existential mode of being, the character of Ebenezer Scrooge in Charles Dickens’ classic story A Christmas Carol, which has been a long-time favorite Christmas tale for me. This story is rich in existential themes and constructs: anxiety and death; freedom and responsibility; meaning and purpose; self-actualization and personal transformation. Upon being confronted with the messages from Marley’s Ghost and the ghosts of Christmas past, present, and future, Scrooge’s existential world is shattered as he is shocked into reality with the awareness that he is not living life as he should, that he is missing the real meaning and purpose of life itself. He is overwhelmed with anxiety as he faces the ultimate threat of non-being, his death, with the recognition that he has freely chosen to live an inauthentic existence devoid of constructive meaning and purpose, and that he is responsible for the consequences that have and will result from this choice, both for himself and others in his life. Scrooge is called forth to answer the greatest and most central existential question, which is, How to be in response to non-being? He can choose and indeed must choose; his choice is his answer and whatever he chooses, he must answer with his very life. Of course, we know Scrooge’s choice within the story, and the powerful transformation that follows is what makes it so deeply compelling, inspiring, and beautiful. Through his choice and commitment to change how he lives his life, his way of being, the threats of non-being are overcome and lives are redeemed: the poor and destitute benefit from Scrooge’s newly-discovered generosity; Tiny Tim’s health improves and he survives, and Scrooge is saved from living a wasted, unhappy, and relationally isolated existence ending in a lonely and meaningless death. I’m not ashamed to say that I cry every time I witness this redemptive transformation in a movie version of this classic tale. Let us remember that this is far more than a feel-good story that touches our hearts once a year during the holiday season. This is the primal narrative of our existential situation in every moment of our lives. We may not readily identify with the character of Scrooge—most of us are likely not excessively wealthy and don’t live solely for our own gain with no regard for the welfare of others. But make no mistake, we are all Scrooge, potentially and actually to some extent within the core of our beings. We all have ways in which we waste our lives living for empty and meaningless purposes, consumed by things that don’t really matter, protecting our false and illusory selves at the expense of others and authentic, meaningful human relationship. We all have forgotten the true nature and purpose of our existence as human beings, which we all desperately need to remember and rediscover. It isn’t about money, financial status, or class inequality, it isn’t even ultimately about Christmas itself. It is about living a fully and authentic human existence at all times and in any given circumstance. So, let us not say with the old, untransformed Scrooge, “Bah humbug,” but let us rather say, with the newly redeemed Scrooge, “It’s Christmas morning…I haven’t missed it!” Let us, throughout this New Year, forsake all that is life-denying and live only for all that affirms the real and true Life within, between, and around us.